A chemical dispersant is a kind of "spill-treating agent" (or "STA") that is designed to break up an oil slick and dilute the oil by mixing it into the water. 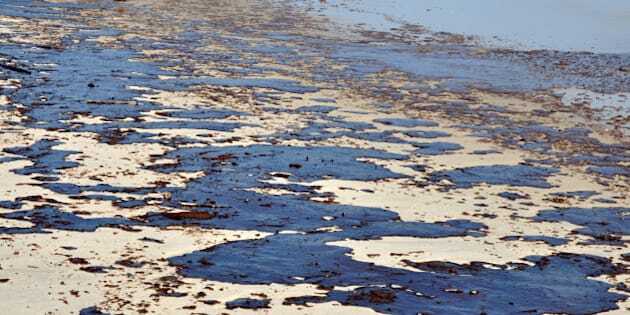 A chemical dispersant isn't truly a clean-up tool -- it doesn't take any spilled oil out of the environment, and by the time a dispersant is applied, it's already too late to save most life forms in the vicinity of the spill. After BP's Deepwater Horizon well blowout in April 2010, responders dumped approximately 1.84 million gallons of chemical dispersants into the Gulf of Mexico in an effort to stop the oil slick from fouling fragile coastal environments. The use of such a massive quantity of dispersants, coupled with serious gaps in knowledge about the possible environment impacts of dispersant use, prompted a public outcry and led the United States Environmental Protection Agency to publicly rebuke the company and order them to use fewer (and less toxic) dispersants. By contrast, in Canada, it has traditionally been unclear whether the use of STAs to clean up marine oil spills is even legal. Because of the toxic ingredients of some STAs, their use could violate several federal laws (such as the Fisheries Act, the Species at Risk Act, the Canadian Environmental Protection Act, 1999, the Migratory Birds Convention Act, and the Arctic Waters Pollution Prevention Act, among others) without special permission that could be sought on a case-by-case basis. On February 26, 2015, the federal government passed Bill C-22, also known as the Energy Safety and Security Act. The Act overhauls the framework governing how STAs may be used lawfully to support oil spill response efforts for offshore oil operations in the Canadian Arctic, Nova Scotia and Newfoundland and Labrador. Simply put, the act allows responders to use STAs without fear of being prosecuted for violating listed anti-dumping and anti-harm laws where use of the STA has been approved and the STA is used to prevent, lessen, or repair harm in a manner consistent with safety and the protection of the environment. Only STAs listed by the federal Minister of the Environment can be considered for approval by the regulator. The list will be set out in a future regulation. It is unclear what criteria will be considered by the Minister when deciding whether or not to list a STA. The regulator cannot approve the use of a STA unless it finds that using the STA will result in a net environmental benefit. The regulator will have to decide that using the STA will achieve a net environmental benefit on two separate occasions: first, when the operator applies for an operations authorization before work on the project begins; and second, after a spill has occurred and response efforts are underway. In other words, the regulator must decide that using the STA will achieve a net environmental benefit both in principle and in the actual circumstances of the spill. However, the Act doesn't explain the factors that will be considered when calculating whether there will be a net environmental benefit. Instead, Cabinet can identify these factors in a future regulation. Until that regulation is made, it's too early to tell whether the net environmental benefit assessment will ensure that approval of STA use is appropriately protective of the environment. Furthermore, existing gaps in knowledge about toxicity and other impacts of many STAs may make it technically impossible, without conducting further research, to weigh the environmental benefits and drawbacks of a given STA in a fulsome, objective manner. For example, the Deepwater Horizon response effort included a novel subsea application of dispersants. Since the impacts of this novel use of a STA are not fully understood, the net environmental benefit of this use cannot be properly assessed. Even if the use of the STA is otherwise sanctioned under the new changes, the operator of the offshore oil project can be prosecuted under the listed laws for any harm caused by the spill itself or by the interaction between the STA and the spilled oil. That said, in some cases it may be difficult or impossible to prove that harm was caused by the interaction between the STA and the oil, rather than the STA itself. This uncertainty benefits the operator. Operators will remain liable for damages caused by the use of STAs under statutory civil liability regimes, including those in the Canada Oil and Gas Operations Act, Canada-Nova Scotia Offshore Petroleum Resources Accord Implementation Act, Canada-Newfoundland and Labrador Atlantic Accord Implementation Act, and Fisheries Act. This is the case even where the operator doesn't apply the STA itself. Overall, the Act will facilitate the use of STAs as an oil spill response tool in certain circumstances by exempting responders from some anti-dumping and anti-harm laws. At the same time, the Act ensures that operators will continue to have some liability for even the sanctioned use of STAs. On the other hand, the Act leaves some significant gaps in the STA approval process; whether the sanctioned use of STAs will be environmentally appropriate or beneficial will depend largely on the contents of regulations that have yet to be made. This piece was written by Ecojustice staff lawyer Ian Miron. As Canada's only national environmental law charity, Ecojustice is building the case for a better earth. Learn more at ecojustice.ca.